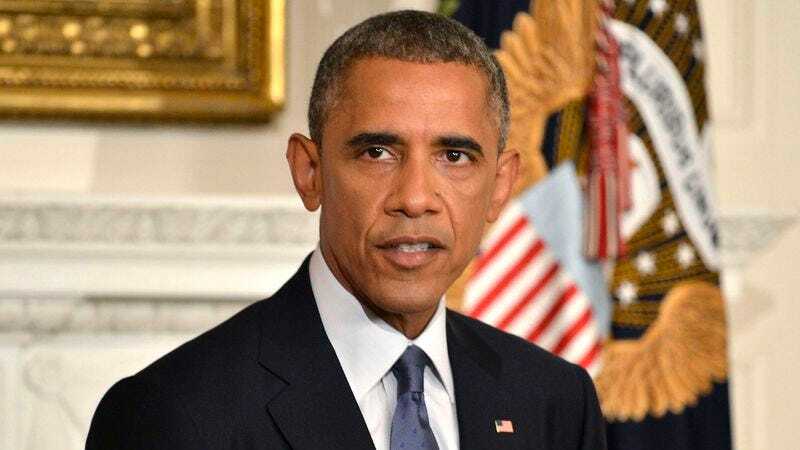 WASHINGTON—Declaring that the terrorist organization’s actions can no longer be ignored, President Obama vowed Wednesday that the United States would use precision airstrikes for as long as needed to ensure that ISIS is divided into dozens of extremist splinter groups. “ISIS poses a significant threat to U.S. interests both overseas and at home, and that is why we are committed to a limited military engagement that will fracture the terrorist network’s leadership and consequently create a myriad of smaller cells, each with its own violent, radical agenda,” said Obama during a primetime address to the nation, stressing that any campaign to transform the group into a patchwork of volatile jihadist factions will not be performed unilaterally, but rather with the support and cooperation of key allies in the region. “I have already discussed this plan with congressional leaders, and I have no doubt that our efforts will eventually replace this militant organization with many smaller but equally determined groups bent on using extreme brutality to impose fundamentalist Islamic rule. It will not happen overnight, but I can assure the American public that, in time, this group will be defeated, allowing us to focus our attention on the countless threats to homeland security posed by its many immediate successors.” Obama added that while the ISIS campaign will not involve American boots on the ground, he reserves the right to deploy troops should one or more of the spin-off cells grow to be even more powerful.